Based on the results of the third quarter of this year, the blockchain startup Ripple reported an increase in sales of its own XRP token to $163.33 million, which is more than two times higher than the previous quarter ($75.53M), but still less than the first quarter ($167.7M). This was mainly achieved through direct sales: a subsidiary of the project, XRP II, sold tokens for $98.06M, that is, almost 6 times more than in the second quarter ($16.87M). 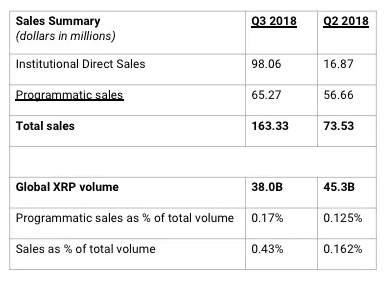 In the same period last year, the direct sales turned out to be almost 5 times less efficient and brought Ripple $19.6 million. Sales of the third-party services increased insignificantly: from $56.66M to $65.27M. The company also reported withdrawing 3 billion XRP from escrow accounts and placing 2.6 billion XRP on new escrow accounts. The remaining 400 million XRPs went into various types of support for the XRP ecosystem. 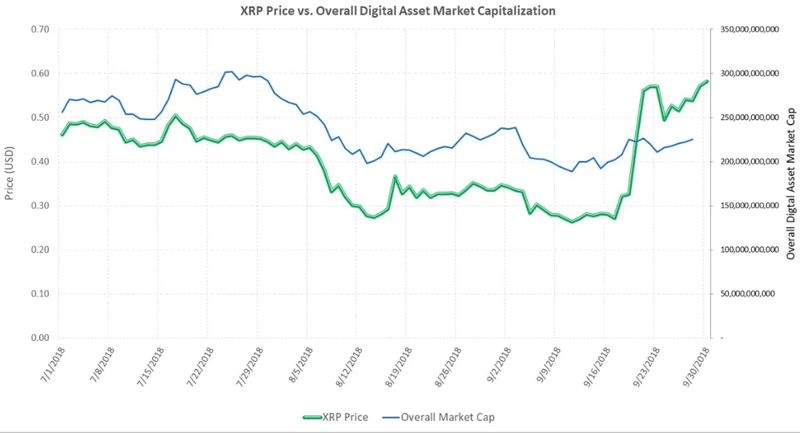 Noting the general trend of a diminishing market capitalization of digital assets in the Q3, Ripple stressed that by the end of the period, XRP was able to regain momentum. Earlier in September, the head of Ripple Brad Garlinghouse said that the best use of cryptocurrency is in cross-border operations and asset savings, rather than in everyday life, so replacing traditional currencies with digital money in the near future is meaningless. Ripple can be described as a payment system for professional market players. At the beginning of October, the startup launched xRapid, a solution for real-time cross-border transfers using XRP as a binding currency. xRapid is focused on payments for providers and financial institutions seeking to improve user experience and minimize costs up to 70% in making cross-border payments, as well as to increase the speed of the latter from 2-3 days to 2 minutes. The actual time of the operation with XRP Ledger network takes only 2-3 seconds, and all the rest of the time is spent on additional processing by third parties, such as exchanges and local payment services. According to a recently conducted survey by Weiss Ratings, the leading provider of autonomous, impartial, and confided crypto ratings and stocks, a decent number of voters had vouched for XRP as the best shoddy crypto to put resources into. It turned out that the Twitter community considers investing in a digital currency such as XRP from Ripple as the best investment in virtual tokens worth less than $1.